Bayern Munich stars Robert Lewandowski and Arturo Vidal are joined by Schalke record-breaker Naldo in the latest instalment of our Official Fantasy Team of the Week. Find out who else made the cut on Matchday 20 below! Rune Jarstein may find Kraft difficult to dislodge from the Hertha starting line-up when the Norwegian stopper returns from injury next month. The 29-year-old custodian was sensational in the Old Lady’s goalless draw at Werder Bremen on Saturday, helping Pal Dardai’s side to a first clean sheet since November with six stunning saves and leaving the Hungarian with something of a selection headache for next week’s clash with Hoffenheim. Jung played a key role in helping Hamburg arrest their run of four successive league defeats on Matchday 20. Not only did the Düsseldorf native set up Filip Kostic’s equaliser in Saturday’s 1-1 draw at high-flying RB Leipzig, he also won 69 per cent of his attempted challenges against Ralph Hasenhüttl’s side at the Red Bull Arena, earning him a whopping 12-point bonus! The last of his four senior international caps came over 10 years ago, but if Naldo can maintain his current red-hot form he might just earn himself a place in Brazil’s squad for the FIFA 2018 World Cup! In Saturday’s 2-0 win at Stuttgart, the 35-year-old broke Ze Roberto’s record as the Brazilian with the most appearances in Germany’s top flight (337), scored his sixth goal of the 2017/18 campaign and won more challenges (17) than any other player on the pitch. All in a day’s work for the veteran centre-back! Dovetailing seamlessly with Leon Bailey during the first half of Leverkusen’s 2-0 win over Mainz, the left-back’s pace and direct running proved a constant menace to the Zerofivers’ defence. The 24-year-old also helped Heiko Herrlich’s side to a sixth clean sheet of the season and capped a fine afternoon by confidently stroking home his second penalty of the campaign midway through the second half. Hannover goalkeeper Philipp Tschauner will be seeing Malli in his nightmares for weeks to come. The 25-year-old former Mainz attacking midfielder netted the only goal of the game in Sunday’s Lower Saxony derby - and what a goal it was! Collecting the ball 30 yards from goal, Malli took a touch before powering an arrow of a shot into the back of the net. Oh, and he also had more shots (four) than any other player at the HDI Arena. Watch: Malli: "I don't know how I did it!" There was no way Vidal was going to let Hoffenheim escape the Allianz Arena with anything other than a defeat on Saturday, even after the visitors had raced into a two-goal lead inside 12 minutes. As well as netting his sixth league goal of the season in the 5-2 victory over Julian Nagelsmann’s troops, the Chilean was also involved in more duels than any other player in Munich, winning 19 of his 31 challenges in total. Cologne looked on course for a fourth straight league victory until Caiuby’s 77th-minute equaliser at the RheinEnergieSTADION. The Brazilian’s late leveller was his fifth of the current campaign - a personal best - while his 18 successful challenges earned him an extra six points to go with his four-point goal bonus. Another one for Brazil coach Tite to keep an eye on, perhaps? 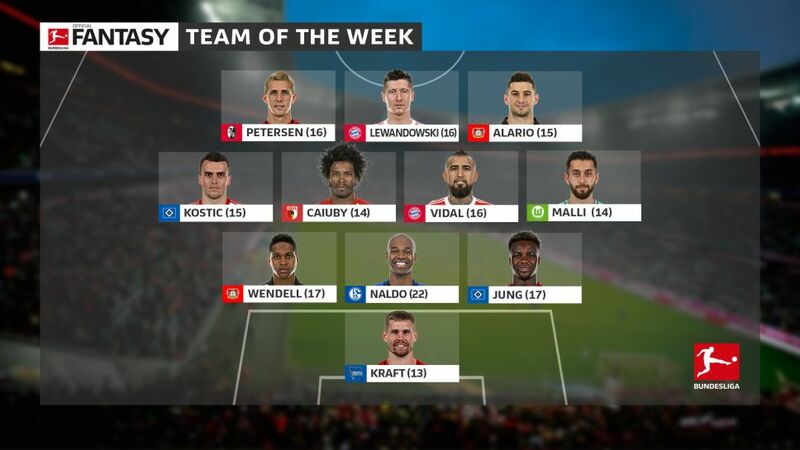 One of two Hamburg players in this week’s all-star XI, Kostic was the Red Shorts’ liveliest attacking outlet in the draw at the Red Bull Arena. Not only did he restore parity after Bruma had given Leipzig an early lead, the Serbia international also had more shots (four) than any other HSV player. Overall, he was involved in six of the visitors’ eight attempts at goal. He may have failed to find the net in Leverkusen’s win against Mainz, but the Argentine forward played no small part in Die Werkself’s ninth league win of the season. Alario provided the assist for Bailey’s stunning 48th-minute strike before winning the penalty that led to the hosts’ decisive second goal. He also had more shots (four) and attempted more duels (32) than any other player at the BayArena. The Pole extended his lead at the top of the goalscorers’ chart on Matchday 20, his flicked effort in the 5-2 defeat of Hoffenheim lifting him onto 18 for the season. Incredibly, he has found the net in every single one of Bayern’s home games this season, making him the fifth Bundesliga player after Jupp Heynckes, Gerd Müller, Pierre-Emerick Aubameyang and Thomas Christiansen to score in ten consecutive home matches. Petersen’s first strike against Borussia Dortmund brought Freiburg level following Shinji Kagawa’s opener, but Saturday’s 2-2 draw at the SIGNAL IDUNA PARK will be remembered for the 29-year-old’s astonishing second. Catching Roman Bürki off his line, the former Bayern striker sent a looping drive over the Swiss custodian’s head and into the back of the net from fully 40 metres. It’s almost a shame there are no bonus points for scoring from near the half-way line!